As Americans increasingly view police abuses caught on camera -- and after police arrested persons who videoed them in Memphis, Tennessee -- a movement arose to enable citizen oversight of police. Who Will Watch the Watchers? is an episodic series which examines police and community in U.S. cities. The series begins with episodes which tell a national story -- that we "drill down" in Memphis. Link to the official trailer for Who Will Watch the Watchers? Episode I: "No Justice, No Peace." 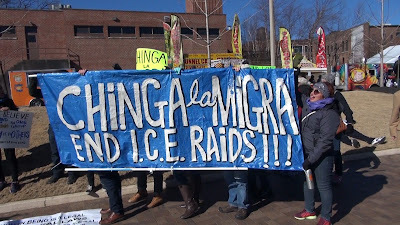 "Chinga la Migra!" die-in on MLK Day at National Civil Rights Museum Jan. 18, 2016, protesting unjust and inhumane I.C.E. (Immigration and Customs Enforcement) raids in Shelby County, Tennessee. Fear mongers are winning the national narrative -- aided by the corporate media -- which plays into right-wing political rhetoric and widens gulf between haves and have-nots. Click to read.